April is one of the most action-packed months in the gardening calendar. Lawns are starting to grow and seedlings are ready for potting-on. Here’s our guide to 10 essential jobs. 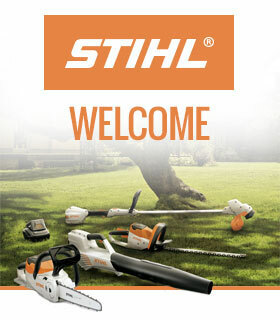 If the weather is fair and grass is growing rapidly, give lawns their first cut of the season. 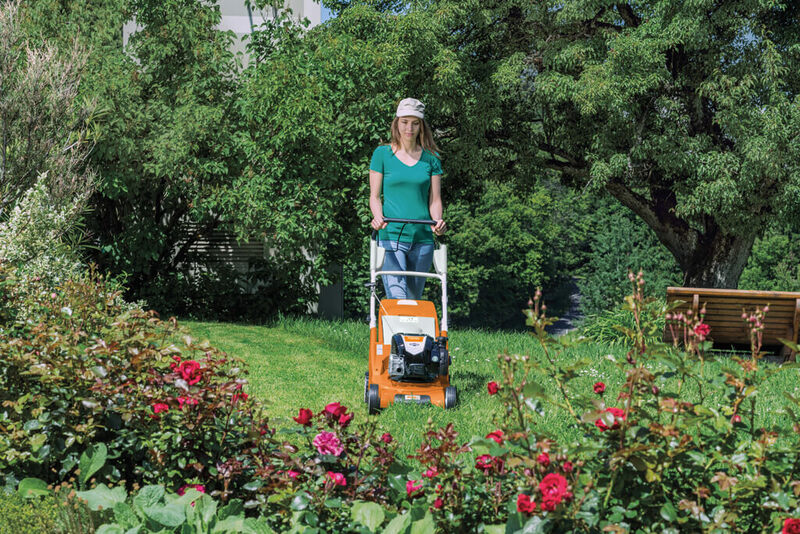 Raise the height of your mower’s blades by a notch or two for the first cut, then gradually reduce the cutting height as the season progresses. Spot-treat large weeds such as dandelion and plantain with a selective lawn weedkiller. To smarten up the lawn’s appearance, use a nylon cord grass trimmer to trim grass along borders, then a half-moon edging iron to straighten up those edges. Tackle bare patches by loosening the soil, sowing grass seed and watering. 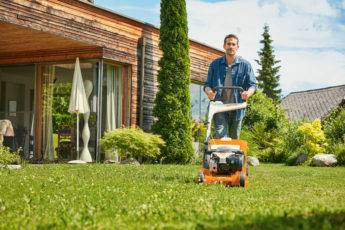 On established lawns, applying a high-nitrogen weed and feed will green-up grass and kill unsightly moss, but check product instructions, because some can’t be applied for a brief period after a lawn has been cut. 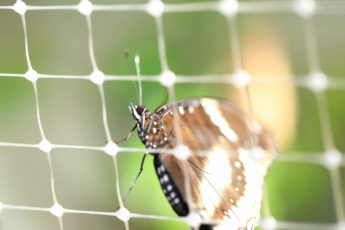 In early spring, blossom, buds and new shoots on fruit trees can be harmed by frost, resulting in poor or damaged crops. If sub-zero temperatures are forecast, small fruit trees such as apples and pears, as well as soft fruit bushes, can be wrapped with horticultural fleece overnight. It pays to keep a close eye on weather forecasts at this time of year, and to have fleece to hand to keep fruit snug. Fruit grown in sunny, sheltered positions, and against south-facing walls, will be less vulnerable to damage. 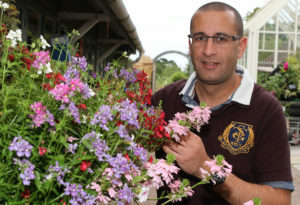 Bedding plants fill hanging baskets, window boxes, containers and borders with colour all summer – and growing your own from seed is much cheaper than buying young plants at garden centres. 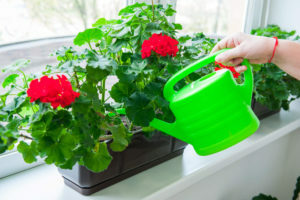 Many popular bedding plants such as busy Lizzies, French marigolds, petunias and geraniums can be sown now in heated greenhouses or on a window sill indoors. Fill pots and containers with a quality seed and cuttings compost, sow seed at the depth indicated on the packet, water lightly using tap water and place in a propagator. It won’t be long before signs of life emerge. It’s one of the oldest clichés in gardening: the answer lies in the soil. And as all good gardeners know, it’s true! Improving soil now will pay dividends come summer, resulting in bigger crops and more flowers. Buy sacks of well-rotted manure and dig or fork it into border soil and vegetable patches (don’t let manure come into contact with stems of shrubs and plants). If you don’t have access to manure, the contents of your compost bin can work wonders. Open the access hatch at the bottom and if the material inside is brown and crumbly, it’s a nutrient-rich wonder that’s ready to be dug into soil. Climbing plants head skywards as temperatures rise. Some, such as passion flowers, are masters of clinging on, using tendrils to firmly attach to supports. Others such as climbing roses and honeysuckle may need a little bit of help, especially if conditions are windy. Use garden twine or string to anchor new growth to supports. Installing trellis can help, too. Obelisks offer shelter and support for climbers while looking ornamental in borders. If you have a greenhouse, sweet peppers are a must. They’re one of the easiest crops to grow and have a multitude of uses in the kitchen – adding flavour and crunch to stir fries, summer salads and fajitas. 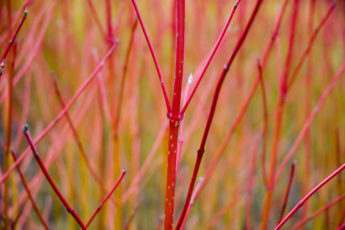 Red, green and yellow varieties are commonly available. Seeds should be sown as soon as possible this month, placing seed trays or pots in a propagator at around 20C. Once the first pair of leaves have formed, seedlings should be pricked-out into pots. 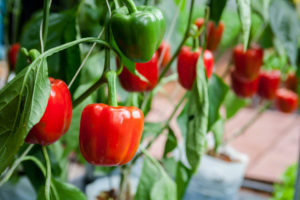 Sweet peppers thrive under glass, but can also be grown in containers outdoors after all danger of frost has passed. Winter rain can wash nutrients from soil, so shrubs will thank you for an early season pick-me-up to replace goodness that has leached away. 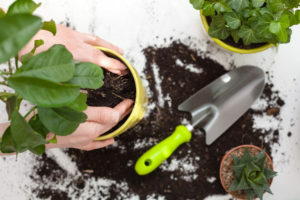 Forking a general-purpose balanced fertiliser such as Growmore into border soil will do the trick, encouraging flowers, foliage and root development. To stimulate roses into putting on healthy growth and plenty of blooms throughout summer, apply rose fertiliser to rose borders now. Ponds are teeming with wildlife in spring, so it’s important to ensure that aquatic conditions are tip-top. Carefully remove twigs and debris from the water’s surface. Congested aquatic plants can be divided and re-potted into special plastic baskets filled with aquatic compost. If fish have little shelter from predators, install aquatic plants such as water lilies. Pond fish will become more active towards the end of the month as water temperatures rise, so start feeding. April is a busy month for veg growers. There’s a host of edible plants to sow under cover now: cucumber, pumpkin, courgette, marrow and, if you didn’t get them started last month, tomatoes. For gardeners without a greenhouse, there are plenty of crops that can be direct-sown; early varieties of Brussels sprouts can be sown outdoors and protected with cloches, while other veg that can be direct sown includes carrots, leeks, parsnips, broad beans, peas and spring onions. As light levels increase and temperatures rise, houseplants put on new growth. Increase watering and start liquid feeding – general purpose feeds such as Baby Bio cater for a broad spectrum of houseplants, while specific feeds are available for orchids and citrus. If a houseplant looks unhappy and has been in its pot for two or more years, it may need to be re-potted (roots bursting from drainage holes at the bottom of the pot are a tell-tale sign). Choose a slightly larger pot and fill with houseplant or loam-based compost. Never use houseplant compost for orchids though, which need an open, bark-based orchid compost that allows air to reach the roots.